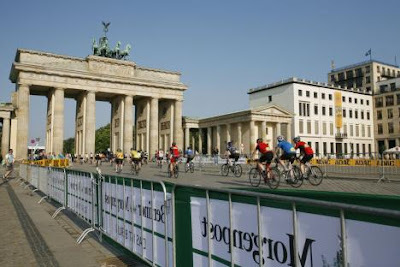 As a loyal long-time reader of Germany's TOUR cycling magazine and a former resident of the capital, I was intrigued to read about the launch of the Skoda Velothon in Berlin in 2008. It was meant to showcase the city and allow enthusiastic amateurs to cycle on closed roads past many celebrated landmarks. Now that I am back in Germany, I took the opportunity to sign up for a fun weekend and I am glad that I did. Renting a car and driving was not the best idea as it actually took longer than the slow trains you have to take if you are transporting a bike but I enjoyed driving the little VW Polo (except during the omnipresent traffic jams and construction slowdowns). The little car cruised very easily at 140 km/h and consumed miserly amounts of fuel while doing it. It took my bike and the usual ton of junk cyclists need when they go anywhere in the back with plenty of room to spare with the rear seat folded down. Having never really driven in Berlin (I did not own a car in the four years I lived there), I was surprised again at just how huge it is and leaving the autobahn I still had 18 kms of in-city driving to get to the friend's apartment where I was staying. Leaving Du"sseldorf at 05:30, I rolled to a stop in Berlin just after 13:00. Quickly getting cleaned up, we headed to the Brandenburg Gate, the most famous symbol of the city. The roads were already closed off and there were lots of cyclists buzzing around the adjoining Avenue of the 17th of June. There was a cycling fair set up with local merchants and well-known international brands hawking their wares, along with the de rigeur beer and bratwurst areas. Within five minutes I had my registration completed and was equipped with my bright green swag bag, which included my 3,000th water bottle and some neat stuff, including shampoon, sunscreen, Sport Beans, and, most important, instructions for the ride itself. I would be doing the ride with two of the Lost Boys who had come to the Pyrenees last summer and I made contact with them so that we would meet up the next morning to get to our start block together. Andrew was coming from Leipzig on an early train and this did not work out so well as one of the inexplicable delays that now plagues Deutsche Bahn struck and he would be stranded in Bitterfeld for an hour and a half. I met Dan, riding his fancy new Cervelo R2, outside Andrew's apartment and we rode over to Unter den Linden and found Starting Block D. There are huge numbers involved in this, the 2nd biggest cycling event in Europe, and all around us were people who, as Dan noted, all kind of looked like us. Helmets, sunglasses, colourful jerseys, fancy bikes. And, to our amazement and delight, Andrew somehow managed to get into our Block D in time to start, although there were so many people we could not find him. Thanks to the miracle of cellphones, we told him to look out for us on the right side after the start as we would slow pedal a bit. A lot of things seemed to be happening at the Brandenburg Gate, and there was cheering for what must have been the start of the race--a group of "promis" were going out first--but eventually our collagues in Block D began to roll out and we were soon off and spinning through the marvellous landmark with its famous Quadriga on top. We turned left and rolled through Potsdamer Platz. Andrew caught up to us pretty quickly and we focussed on holding a good position in the group. With some 13,000 participants divided between the earlier 60 km route and our 120 km one, there were some pretty wide variations in speed and skill levels and several times at this early point we were overtaken by some very fast cyclists riding in disciplined team formations. Our route took us through the Tiergarten and into Charlottenburg, my old Kiez, and then into the Grunewald. The road became quite narrow here and the majority of the few hills on the ride were to be found here. I lost Andrew and Dan as faster riders forced their way by on the left and slower climbers blocked me in front but I figured I would catch up to them at the food stop. The ride alongside the Wannsee and then along the no-cars-allowed Kronzprinzessenweg was second nature to me as I used to ride it several times a week. With long straight stretches I was able to go into time trial mode. I wanted to shorten the distance Dan and Andrew were ahead and I was surprised when I looked back and saw that I was now leading a train of a dozen very fast-looking riders! Past the huge mansions in Zehlendorf and then a sharp right as we rode south to Teltow and left Berlin proper for the Bundesland of Brandenburg. Riding through the typical Brandenburg villages, houses in a single file spread out along the road, we were cheered on by hundreds of spectators. Things went swimmingly as I moved from fast group to fast group until we turned east near Gro"ben and met a fierce headwind. Schluss mit lustig, as the Germans say. "So much for the fun..."
It was a hard slog through open fields most of the way to Ludwigsfelde but I was starting to feel better when I pulled into the food stop. I quickly spotted Andrew and Dan and downed some water. Andrew was not feeling very well and was going to ride slowly. I was feeling pretty good at this point and thought I would ride ahead and see how things looked. To my surprise, I found myself on a stretch of autobahn and although the wind was still strong it was more from the side than the front so for the next ten kilometres or so Iwent into full time trial mode, holding a pretty steady 34-36 km/h. I kept hoping a group near this speed would come up at some point but except for some of the club riders it looked like after the food stop everything had gotten disorganized and everyone was riding for themselves. I had also seen a surprising number of accidents, with injured cyclists stretched out on the ground or being assisted by ambulance crews. Oddly, none of the crashes took placed on the tricky turns but rather on straight areas in the middle of nothing. Of course, the fact that Germans tend to ride their bikes the way they drive their cars and cut you off after passing probably did not help. I was almost taken out myself by an overtaking group on the B101 autobahn stretch. Near the bear statue marking the boundary of Berlin a big crowd had gathered so of course I had to sprint a bit as I went by. I was starting to feel the effects after the 100 km mark and I was working hard to stay hydrated. The weather had been ideal but it was now hot and the sun really beat down as we approached noon. I felt that I was getting my strength back when we made the turn into the former Tempelhof Airport, which is now a sort of multi-use park with runways. Of course, the runway was taking us due east and I really was battered by the headwind here. It was very cool to ride the entire length of the runway, considering that the last time I had actually been on the runway I had been sitting in a PanAm Boeing 727. We passed through Kreuzberg and Friedrichshain, passing the O2 Arena and then returning to Mitte and the Tiergarten. As I swung past another famous Berlin symbol, the Siegesäule, or Column of Victory, whose crowning statue, known familiarly to Berliners as the Gold Else, was recently restored to her golden glory, I felt a stabbing pain at the top of my right leg. Stupid cramp! The muscle was seizing up rapidly and I was considering getting off my bike and shaking it out, but with less than 1000 m to go I shifted to an easier gear and found I could spin pretty quickly. The route was marked with countdown signs--750m, 500m, 250m--and I found that I actually had something still in reserve so seeing quite a few cyclists ahead I put on full steam and surged for a big sprint finish. The photos, taken near the finish line, show me with the game face, but I was pretty happy with my ride and I really enjoyed the day out. Turning in the transponder was easy and I got a receipt for it and my medal. I sat under a tree and had a cold Erdinger (alcohol free), took off my shoes to ease my burning feet, and called Andrew. He was near the Brandenburg Gate with Dan so I rode back over there and met them, along with Dan's friend Caroline, who had very thoughtfully brought some pizza along. Andrew was concerned about the state of his training as he will join us for the next Lost Boys trip this June in Austria but in fact he and Dan, in spite of their talk of riding slowly, only finished 65 seconds behind me. It had been a great day. I had averaged over 33 km/h for the 118 km course and felt good. I did not stay around for the pro race organized by German former sprinting star Erik Zabel, but it was the first time it had been added to the Velothon progamme. It was won by a young German riding for the Dutch Skil-Shimano team. 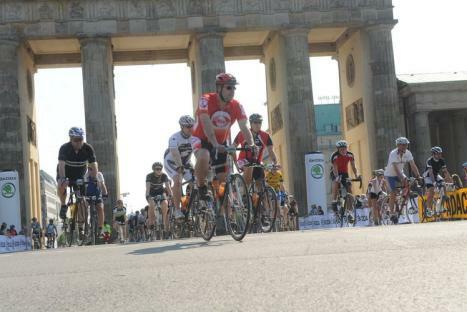 Several years ago I rode the Cyclassics Jedermann Rennen in Hamburg which, with 22,000 participants, ranks as the largest in Europe. Now that I have ridden the Skoda Velothon Berlin and the Cyclassics Hamburg, it is a shame a similar event that was to have run in late July in Munich has been cancelled for 2011, although the organizers (which include TOUR) hope to have it on for next year. The cost of an event that basically sees a major city's streets closed for most of the day must be considerable and I found the organization of the Velothon very impressive, and worth recommending. Thanks for the write up. I'm keen to do this next year. It's basically my old neighbourhood. I grew up in The Lausitz (southern part of Brandenburg), studied in Potsdam and worked in Charlottenburg for a few years. Well done on your average speed! hello Leslie, congrats! too bad we didn't meet at this event, but i gave the Velothon a swerve this year, as i have to get some Brevet kms in, so i went out Saturday night for an overnight ride. it IS funny how the accidents happen on the straights: same thing in 2009: only accident i saw was on a perfectly straight clean smooth stretch of road. until next time, in Berlin or Duesseldorf! It was a good ride, but I probably only need to do it once. There are so many fantastic cycling events in Germany that I don't feel a need to repeat myself. But I doubt if I am going to average 33.5 km/h anywhere else!